The Blackhawk Tatang is a fearsome fixed blade fighting knife based on the traditional Filipino barong. Its long blade is weighted towards the tip, putting extreme force into every chopping blow and giving you plenty of reach. 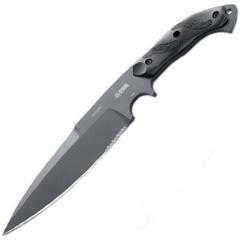 The main edge is a versatile combination style, with serrations near the base. The false edge is also sharpened, enhancing its penetrating power and allowing deadly back cut strokes. The knife features a pistol grip handle that provides multiple secure gripping positions, and its subhilt allows you to choke up for greater control. Its textured thermoplastic panels prevent it from slipping out of your hand. It comes with a tough ballistic nylon sheath for protection between uses.